Defined generally as the breakdown of matter due to (electro)chemical interactions with its environment, corrosion affects every metal that humanity uses. These chemical interactions can then alter the physical properties of metal, affecting its reliability in a negative way. As a result, corroded metal can fail, potentially catastrophically. Far from being the avoidable result of a narrow set of conditions, corrosion occurs readily in most environments. 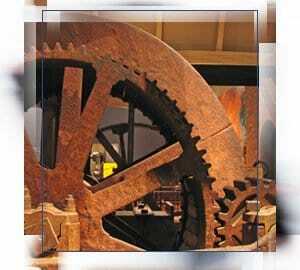 The most telling example of this is rust, the result of iron chemically bonding with oxygen in the presence of water. Since both water and oxygen are present in air, rust is possible whenever iron is in contact with air. In fact, most metals ordinarily undergo corrosion in their natural state. The few that do not react strongly in their natural state, such as gold or silver, are prized primarily for that quality. Because of metal’s natural tendency to corrode, it should always be a consideration when dealing with anything metallic. 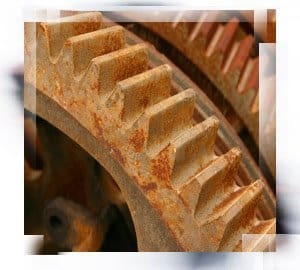 Essentially, corrosion affects metal by modifying its chemical structure and, as a result, its physical properties. In the real world, this takes on many forms. If the products of corrosion remain attached to the metal, they result in added weight and volume, causing additional strain. If the products flake off of the initial piece of metal, then corrosion is free to continue deeper into the metal, slowly eating away at the whole. Other effects sometimes visible to the naked eye are the formation of cracks, pits or crevices that obviously degrade the metal’s structural integrity. Several other forms of corrosion, most notably hydrogen embrittlement, as well as intergranular and dealloying corrosion, attack the internal, molecular structure of metal without any clear external visible effects, weakening it so that ordinarily acceptable stresses can result in unexpected failure. Because the chemical reactions that comprise corrosion are a result of the innate properties of metals, overcoming them is very difficult. Thus, many methods of dealing with corrosion seek to either redirect corrosive forces or to slow them down to an acceptable rate. Popular methods include covering the metal with a material more resistant to corrosion as a protective shield or placing a metal even more vulnerable to corrosion near the vital structure to draw away corrosive factors. Other methods involve the use of special materials, controlled environments or electrical currents. Corrosion damage can be relatively harmless, such as the rust residue left by the bottom of a can of shaving cream on your sink. Other times, corrosion damage leads to catastrophic failures, such as the collapse of the Silver Bridge, where 46 lives were lost and a major highway was closed. Alternatively, corrosion can compound poor design decisions, such as the Guadalajara sewer explosion, which caused over 200 deaths and left over 2,000 injured and 20,000 homeless. Aside from the dangers of mechanical failures, corrosion also poses direct biological hazards. When pipes carrying drinking water suffer serious corrosion, potentially dangerous substances can leech into our water supply. On the other end of the scale, surgical implants and instruments have to be especially resilient or they risk harming the health of patients. Because of the reliance of construction on metal and how vulnerable it is to corrosion, numerous studies have been carried out to gauge its financial impact. A lengthy nationwide study completed in 2001 estimated that the direct cost of corrosion to the United States in 1998 was 279 Billion dollars, 3.2% of the U.S. GDP. Furthermore, the study said that indirect costs, much more difficult to accurately calculate, were likely to have been even higher, raising the total cost of corrosion to around 6% of the GDP. Some of this cost was found to have been avoidable, where existing technologies, materials, and methods were available to prevent the expense. More than half, however, was deemed unavoidable, a staggering expenditure with no known process for mitigation. Responding to the necessity of dealing with corrosion, several industry-wide organizations have gathered experts and interested parties together, publishing voluntary standards to address these concerns. Benefitting everybody, the use of standards promotes fair competition for producers and safe, reliable products for consumers. Key among standard-developing organizations involved in corrosion control are ASTM International, formerly the American Society for Testing and Materials, and NACE International, formerly the National Association of Corrosion Engineers. ASTM standards include widely applicable corrosion tests, methods of measurement, data analysis, equipment calibration and information management, ensuring that the results of reliability tests are both accurate and precise. NACE standards include more specific applications, ranging from materials selection in H2S-containing environments in oil and gas productions (parts 2, 3), or cathodic anti-corrosion measures for steel water storage tanks. It should however be noted that ASTM and NACE both publish standards detailing procedures from the widely applicable to the niche. Accounting for corrosion plays an immense role in industries touching every aspect of our lives and cannot be taken lightly. Standards published by organizations such as ASTM or NACE represent the sum total of human knowledge when it comes to managing corrosion and serve as an indispensible resource. As such, the widespread use of standards promotes increased reliability and safety, translating into a higher quality of life for all.